Can Trained Dogs Alert Diabetics To Low Blood Sugar? : Shots - Health News Trained dogs are increasingly being used to help people with diabetes detect hypoglycemia. One study finds the dogs can indeed do that, but aren't as reliable as a continuous glucose monitor. 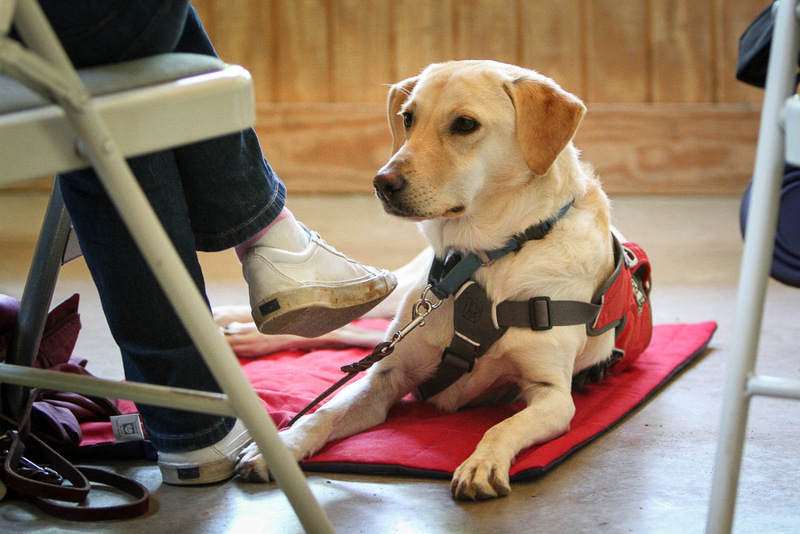 Diabetes alert dogs are trained to detect low blood glucose in a person. The dogs can cost $20,000, but little research has been done on their effectiveness. These dogs are trained in a variety of ways, and although they receive certification, there is no universally accepted test to ensure their competence. Fully trained dogs can cost in the $20,000 range and typically aren't covered by insurance, although some nonprofit organizations can help offset the cost. 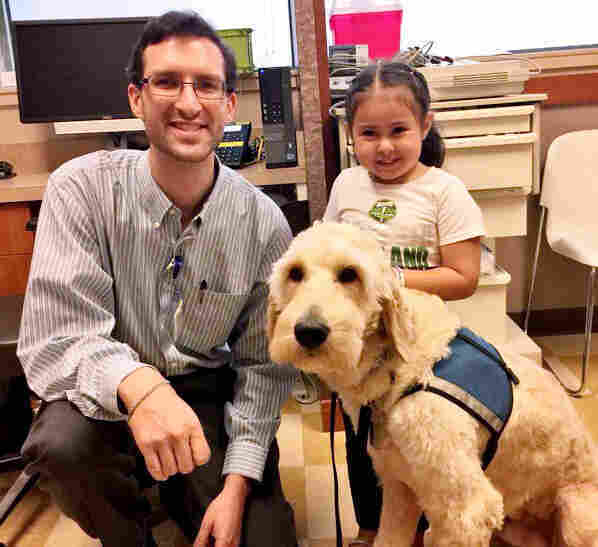 But as the popularity of diabetes alert dogs to detect hypoglycemia has increased dramatically, their effectiveness is largely unknown, according to Evan Los, a pediatric endocrinologist at Oregon Health & Science University who has studied their use. "Though dog trainers and dog users are generally enthusiastic," he notes. Moreover, it's not clear exactly what the dogs may be detecting. Are they actually "smelling" low blood sugar, or are they reacting to typical hypoglycemia symptoms in their owner, such as sweating or shaking? Two new studies add scent to the trail. One, published in the journal Diabetes Care, suggests that the dogs may be smelling a particular substance in the person's breath that rises as blood sugar falls. But a second study, presented by Los at the recent meeting of the American Diabetes Association in New Orleans, found that although the dogs do appear to detect low blood sugar, they also often alerted owners when they didn't have low blood sugar, and were usually slower than a CGM to alert to actual low blood sugar. In the Diabetes Care study, Sankalpa Neupane and colleagues at the University of Cambridge measured the amounts of volatile organic compounds in exhaled breath in eight adult women with Type 1 diabetes. When the patients were given insulin infusions to induce hypoglycemia, levels of one of the most common VOCs in human breath, called isoprene, rose "strikingly," the researchers said. No relationship was seen between hypoglycemia and any other VOC, including acetone, ethanol or propane. This week the NPR podcast and show Invisibilia explores how people change from the outside in. We look at an all-women debate team in Rwanda, a country that has declared gender equality. We look at twins who introduced an app into their relationship and how it changed them. And a man who met a bird that transformed his view of the world. It's not clear exactly why this happens, but one theory is that isoprene may be a byproduct of cholesterol production, which may be influenced by blood sugar levels. Or the fast heart rate and blood flow that accompany hypoglycemia may simply result in the delivery of more isoprene to the lungs. While diabetes alert dogs were the impetus for this study, the researchers didn't test dogs to see if they react to the chemical. It's certainly possible that isoprene isn't the whole story, says Dr. Mark Evans, the study's lead investigator and a University of Cambridge lecturer. "All we have done is find one signal," he told NPR. "I suspect that dogs respond to a combination of cues including [VOCs], but also subtle behavioral cues." Asked to comment, Los said, "Their study didn't test whether dogs have any ability to detect or alert to different concentrations of isoprene, so ... whether this is a compound used by the dogs is unknown." Los became interested in diabetes alert dogs when some of his patients asked his advice about getting them. "I didn't know anything about them. It turns out almost no one did, but patients were using them anyway." He and his colleagues studied eight patients with Type 1 diabetes ages 4 to 48 years along with their own trained dogs for one week each, comparing the dogs' accuracy with those of both fingerstick and CGM blood sugar monitoring. The dogs did alert the owners over three times more often during low blood-sugar episodes than when blood sugar was normal. But just 12 percent of the 16 to 20 average weekly alerts occurred when the patient actually had hypoglycemia. And when both the dog and the CGM alerted, the CGM alerted first in 73 percent of low blood sugar events, an average of 22 minutes sooner than did the dog. Los speculates that the dogs might also be reacting to high blood sugars or rapid changes in blood sugar, situations that CGMs also detect and provide feedback for. "Given that a CGM differentiates its alerts clearly, the dog is operating at a disadvantage." Despite the many false alerts, surveyed dog users were very satisfied (8.9 on a 10-point scale) and fairly confident (7.9/10) in their dog's ability to detect hypoglycemia. Dr. Evan Los with one of his patients, Sophia, and her diabetes dog St. Nick. Evans told NPR those results don't surprise him. "I suspect that dog owners are more tolerant of false negatives [from their dog] than a device falsely alarming, which really irritates." For patients without CGMs who have a trained dog and find it helpful, Los says that "I would never tell them to get rid of it, because it's alerting them to more hypoglycemia symptoms than they would otherwise know about." More research is needed, he said, to determine whether particular training approaches, breeds or other factors might make dogs better hypoglycemia-detecting best friends. "Although it appears CGM outperformed trained dogs in this study, it is intriguing that dogs were able to detect some hypoglycemia," Los said. "Perhaps understanding what factors impact dog reliability could help optimize dog performance." Then there's the warm fuzzy effect. Other possible benefits not measured in the study could include having a positive partner in the daily management of a chronic disease, Los added, especially one "in which the daily tasks are not very rewarding." This story is part of the bonus material for NPR's podcast and show Invisibilia, which this week tells the tale of a woman who uses a blood-glucose monitoring app to track the health of her twin sister from afar.